The Big Picture: How we communicate and make decisions in the business world is changing rapidly – and the Internet and social media play a growing part in both. By harnessing the power of content, you can engage clients in conversations and topics that are most important to you, demonstrate your expertise, build trust in your brand, and grow traffic to your firm’s website. But, with the vast amount of content being produced every day, how can firms break through the clutter? WSG’s Join the Conversation webinar, Content is King, discusses the key steps and tips to best leverage the Internet and WSG to improve your firm’s online visibility and ultimately help meet your business goals. Have a plan. In order to produce a consistent stream of high quality, relevant content, you’ve got to have a plan. Start by creating an integrated strategy that aligns with your overall business goals. Next, determine what information and news are the most important to your existing and potential clients. Your plan should include an editorial calendar with specific tactics, suggested topics and headlines, content deadlines and allocated responsibilities. While it’s a major undertaking, you’ll be thankful for your hard work in the end. Create meaningful content. Your clients are searching for information, answers and validation, and they trust sources that consistently provide all three. Be relevant and engaging – demonstrate your expertise and how you solve client problems. Include a mix of content types including original (by firm experts), curated (3rd party content with commentary from a firm professional) and syndicated (3rd party content republished on your site). Distribute and promote across distribution channels. You took the time to create great content – now make sure it is received, read and shared. Repurpose and optimize content across multiple firm, WSG and other available channels and tools (yes, plural) – and make sure content is easy to share. Give people the best chance to see your content. Measure & refine. In order for content marketing to be successful, you must have analytics to regularly track user behavior and be committed to refining your approach as necessary. 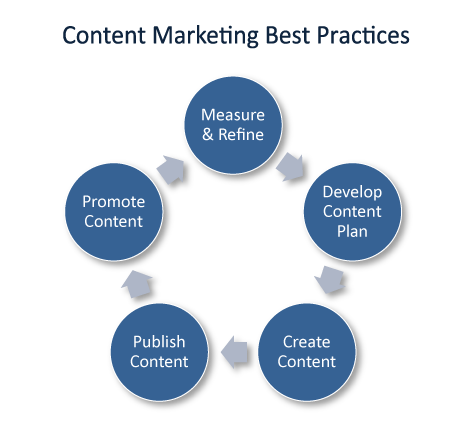 Content effectiveness can be measured through web analytics, social media activity, downloads, comments and more. Are you harnessing the power of your content? For a more in-depth look at how to leverage content marketing for your firm, view a replay of WSG’s recent webinar “Content is King”. Content is King is the third webinar in WSG’s Join the Conversation Webinars series. Presenters include guest speaker and WSG Alliance Partner, Joe Beccalori, Co-Founder and President of Interact Marketing, as well as WSG’s own Maricarmen Trujillo, VP, Jess Ferdinand, Marketing Director, and Kendall Repka, Senior Marketing Coordinator. The Join the Conversation webinars are a critical part of bringing additional expertise, resources and value to the network and ensuring that we are doing everything we can to make sure your content – and your firm – get noticed. If you would like to discuss how to best leverage WSG’s web-based marketing initiatives and opportunities for your firm, please email [email protected] to schedule a time.